From Wednesday 11 October 2017 until Sunday 12 October 2025: Enjoy 15 % off! From Wednesday 11 October 2017 until Sunday 12 October 2025: Enjoy 10 % off! Synonymous with calm, relaxation and rest, the Palais Rhoul is a veritable haven of peace in the heart of Palmeraie in Marrakech. Inspired by Greco-Roman architecture, this marvellous building is supported by 180 columns. It is encircled by a lush 5-hectare garden, consisting of a rose garden, palm trees and rare trees, creating a world of unique colours and smells. 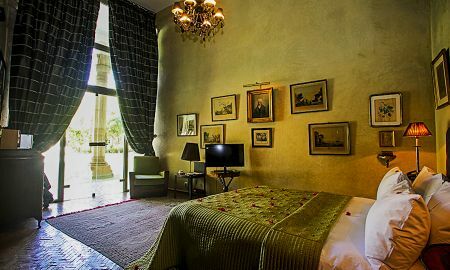 The main lounge is decorated with ancient objects and artefacts and fine paintings. At its centre is an oriental pool covered in flower petals. 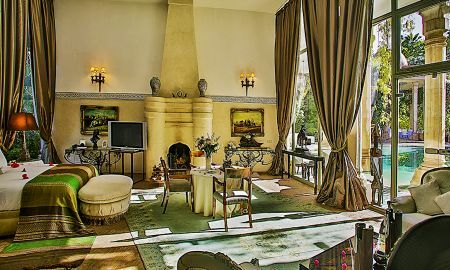 The Palais Rhoul's rooms and suites afford a unique and elegant decor, some overlooking the wonderful gardens and others overlooking the pool. 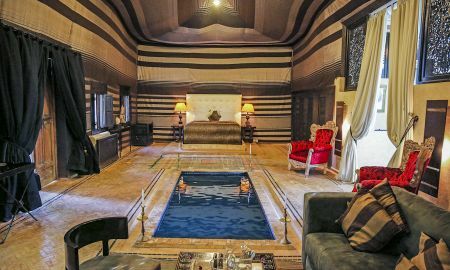 Moroccan tents, set in the park, are home to luxurious suites, perfectly fitted out and offering their own indoor pool, immense chimneys, tall ceilings over 8 metres high, and silk fabrics lining the walls. You can enjoy an excellent continental breakfast every morning. The Palais Rhoul's restaurant invites you to savour international specialities. You can also spend a nice time at the bar sipping a drink. The hotel's spa has a hammam, a Jacuzzi, two outdoor pools and offers massages and treatments. For your entertainment, the hotel organises various excursions. You can also enjoy the library and the Moroccan lounge. In addition, garden furniture is spread out on the lawn for you to relax in an exclusive setting. 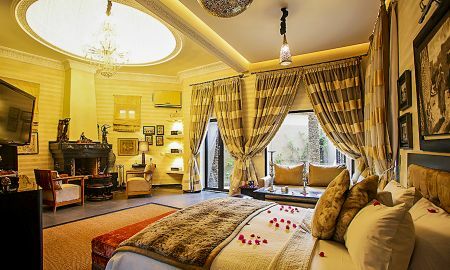 The Palais Rhoul is located in the Palmeraie district, just 7km from Marrakech. Marrakech-Menara Airport is a 30-minute drive from the hotel.